In the competitive world of multi-discipline sport, your tri-suit needs to be both reliable and enduring; new British brand Tenola Tri-sportswear has been specifically designed, by Triathlon enthusiasts, to enable seamless transition between each of the swimming, running and cycling stages of the event. As early as the 1980’s, Tenola CEO and founder Ian Nolan saw a gap in the market for high quality British designed and manufactured active apparel. It was only when he took voluntary redundancy in 2012 that Ian finally had the opportunity to make his concept of Tenola Triathlon Wear into reality. Inspired by his mothers’ sewing background, Ian had a clear vision for a range of multi-activity sportswear, developed, tested and approved by tri-athletes. Tenola commissioned seasoned swimwear and sportswear designer Sally Blake in 2014 to develop Ian’s vision of the Tenola brand, from initial conception right through to the production process. The Cambridge based designer drew on her expert technical knowledge of textiles, created specifically for the specialised field of athletic wear, and her extensive research with elite triathletes to develop exciting designs coupled with perfect fit and function. Sally used her expertise to recommend premium Italian fabric manufacturers able to provide the highly technical materials required to produce the cutting edge Tenola products that will help transform triathletes, from weekend warriors to elite athletes. This working relationship has enabled Tenola to bring to the market a range of stylish, British designed and made, high performance triathlon clothing. The first Tenola prototypes were produced in late 2014 and used for sizing, fit and performance evaluation. The following year a second, modified prototype was produced leading to the development of the two piece range and swim training clothing. After a period of further product testing and the development of a new, cutting edge fabric, 2017 saw the first production run of the Tenola tri-suit. The Tenola brand officially launched in February 2018, offering a range of British made swimsuits and tri-wear for men and women. 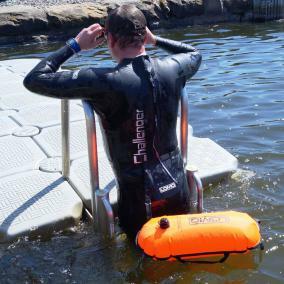 Tenola is proud to announce that it will soon be expanding its Tri apparel offering to include wetsuits. Keep an eye on our website for updates and follow our blogs for more information on this exciting new development which enables us to offer a complete British made Triathlon wear package for both novice and experienced tri-athletes.